Non-covalent interactions, such as pi-stacking and hydrogen-bonding, play a critical role in nature, influencing both structure and function. These weak, yet important, forces influence everything from protein folding to the ability of enzymes to stabilize transition-states. Cooperativity between functional groups via their strategic geometric arrangement can bring about dramatic stabilization effects, and in turn achieve truly remarkable catalysis, large modulation of redox potentials, strong substrate binding, or simply exceptional selectivity in recognition events. My research is focused on the design of materials and catalysts that leverage non-covalent interactions and cooperative effects, as well as various other aspects of supramolecular chemistry. I aim to solve critically important problems in organic & materials chemistry by combining aspects of synthetic chemistry, computational chemistry (for the design and understanding of various phenomena), physical organic chemistry (for the study of mechanisms, including kinetics), and device fabrication/characterization were applicable. 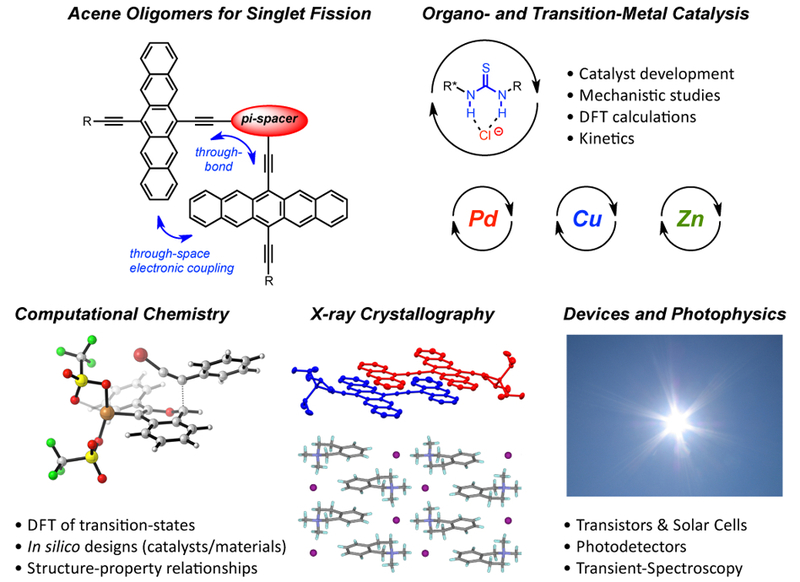 One such example includes our design of pentacene dimers with linking strategies that facilitate electronic coupling between chromophores for singlet fission as a result of carefully balancing through-space and through-bond interactions. The ability to effectively implement singlet fission processes enables the design of solar cells that can circumvent the Shockley-Queisser performance limit (ca. 30% efficiency).